The Gowanus Lounge: Gowanus Groundwork Laid for Toll Brothers in "Subarea B"? Gowanus Groundwork Laid for Toll Brothers in "Subarea B"? In Thursday’s April 19th meeting NY City Planning held with the Gowanus community, was anyone listening to anyone? The community was busy talking about whether housing should be allowed anywhere along the water’s edge while the Department of City Planning was trying to get us to talk about how high housing should be at the waters edge and how much parking should be included in such housing developments. It didn’t seem that anyone in the community even embraced housing or parking as a redevelopment goal or necessity. But it seems clear from the meeting that the groundwork is paved for handing Toll Brothers the zoning change they have been demanding. Somewhere along the line, before holding these community-planning meetings, decisions were made. It is now obvious why City Planning first presented us with the new five Subareas, Subarea B is slated to be handed over for residential development ASAP! 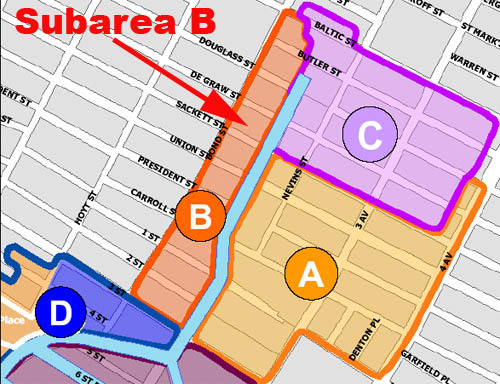 There has been no discussion as whether Subarea B (Toll Brother’s and Bayside proposed residential development sites) should be residential or continue to act as a protective buffer zone for the “existing residential use a short block away”. There has been no discussion about how this area might be better utilized under existing zoning, or green rezoning under it present use. There has been no community discussion about how this stretch of land sits along the section of Gowanus that receives the greatest volume of sewage. There has been no community discussion about the limited reduction in sewage the Gowanus will receive under the DEP Pumping Tunnel reconstruction plan (especially with predicted raise in rainfall volume). There has been no community assurance that the new Flushing Tunnel will do little more that shift the pathogen center from the head of the canal to a few blocks south as tides and sea level push higher in from the harbor over the next 50 years. The Department of City Planning has presented no reasoned argument to the people of this community as to why Subarea B should be granted a zoning change to residential use...City Planning needs to do more homework here. Look for the discussion about Gowanus' future--which will be decided by the zoning decisions--to be spirited, to say the least. How does Toll expect to pay for all the costs of cleaning up the toxic oil etc areas they want to build on? Are they being checked by EPA? Will they be around in a few years to write checks for peoples' illnesses due to the toxins that they get exposed to in their new Toll Brother's condos? Why are the devlopers all getting a free ride...risk free? Who is being paid off in the City/State/Feds? Who Needs a Sidewalk on Berry Street Anyway? Sign of Hope in Trying Times: Koolman Lives!! !